The future of infra is hybrid, fully automated and invisible . With the advent of the 3rd Platform compute, storage & network as well as key related aspects like infrastructure management and security, will change completely. In this post I will have more detailed look at the possible storage related changes. 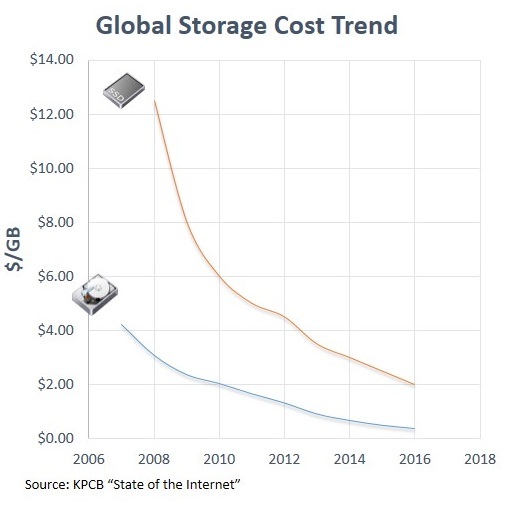 For storage the immediate future is software based. There will be less reliance on physical SAN (Storage Area Network), NAS (Network Attached Storage) and direct attached storage (ie internal disks). Also the move is clearly towards solid state discs like Flash storage. Question is when, and not if. The change will not be a big bang, but a step by step and gradual change. The price reduction of WAN bandwidth, the increase of WAN quality of service as well as the decrease in actual storage costs has opened new opportunities and the trend is clearly continuing. Enterprise Flash Drives (EFDs), a sub-set of Solid State Drives (SSDs), typically used in Enterprise storage for high performance and reliability, are of either of single cell or multi cell configuration and can support up to 3000 IOPS (input and output per second) per drive depending on capacity and setup. We see capacities starting at 72GB going up to 500GB+ per drive. Single cell drives have better endurance as compared to multi cell drives. SSD will emerge over the next few years as the key physical with Flash storage cards being inserted straight into the CPU Bus achieving a factor 2000 increase in speed vs a standard hard disk. SSD is already standard for many laptop manufacturers. 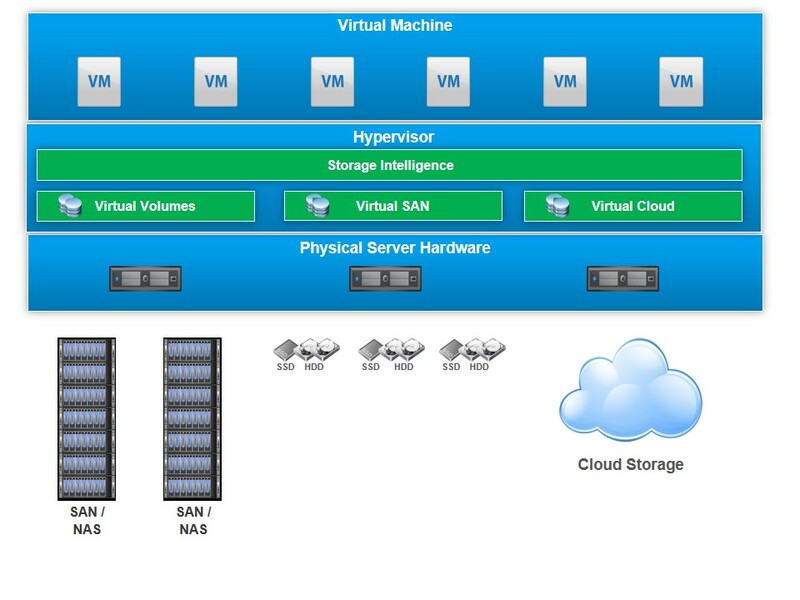 Virtualizing multiple storage frames, like described above, using technologies like IBM SVC and EMC VPLEX. 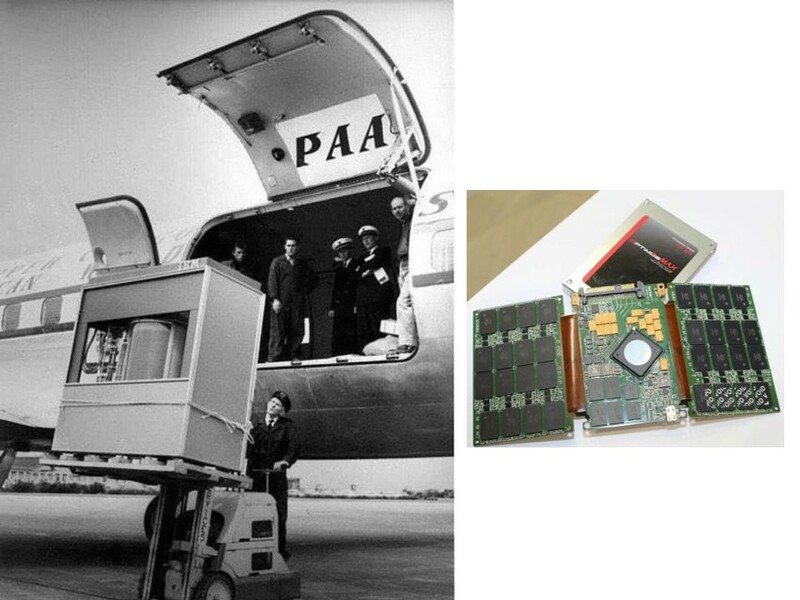 Over the past 50 years storage has seen incredible changes and enhancements – below is a picture of the 1000kg heavy 5MB Hard Drive that was used by the IBM 305 RAMAC. Compare this with the latest SSD 2.5-in 4TB SanDiskOptimus MAX SAS SSD. It would have taken 840,000!!!! IBM 5MB hard drives, weighing an incredible 840t – which is the equivalent to 2 fully loaded Boeing 747 Jumbo Jets, to store the 4TB! The main area of innovation in the storage area is the move towards software based storage (I am referring here to the next 2-5 years). Vendors like EMC, VMware as well as new entrants like Nutanix etc are pushing the storage intelligence from the storage devices into software. VMware vSAN is part of the vSphere hypervisor – EMC ViPER is another offering that enables implementation of a software based storage services. This means that the typical storage capabilities like automatic tiering, snapshot, replication, de-duplication, RAID (Redundant Array of Independent or Inexpensive Disks) etc moves from dedicated hardware to the hypervisor, “sitting” right next to the OS (operating system). All that is needed is a disk array with simple SSD or/and FC or/and SATA as the intelligent that was previous in the storage controller is now on the OS layer. This also means that there is the possibility to use one storage management capability across dedicated storage like SAN, NAS and dedicated with its “own intelligence” next to say one array of SSD and pure public cloud. 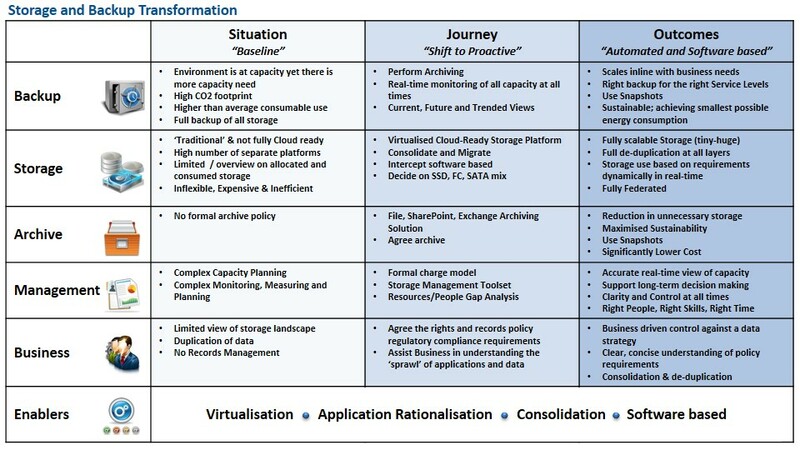 Clearly it very much on the actual client situation, on the actual requirements – like performance and latency characteristics, BCP (business continuity planning), RTO (Recovery Time Objective or Return To Operation) and RPO (Recovery Point Objective) – plus you will connect this with the compute, network and security story – so the above is a simple transformation example that shows the relationship between these closely related aspects. Given the speed of innovation a lot more will change over the coming years. By 2018, 40% of midsize enterprises will replace all data centre servers and storage with integrated systems. (Predicts 2015: Midmarket CIOs Must Shed IT Debt to Invest in Strategic IT Initiatives, Gartner, 2014). Gartner’s projections suggest that by 2016, 20% of organizations will abandon backup and recovery technologies in favour of exclusive use snapshot and replication. By the end of 2016, they expect that more than 50% of enterprises will store customer-sensitive data in the public cloud. By 2019, they predict that 25% of all mission-critical workloads will be supported by all flash arrays. As noted above, the future is hybrid with a mix support for SAN, NAS and dedicated (future legacy), simple arrays either network attached or within the server hardware and cloud. SSD will be the dominant storage as soon as the per GB price will be comparable to that of a FC or SATA and considering TCO and not just the buying price difference than this might not be too long off. Can we leverage architecture in a VUCA business environment?